The right gets it wrong. I was genuinely surprised that Bill O’Reilly and Judge Napolitano were so clueless about the First Amendment. Yes, O’Reilly is clueless on jihad — when he deigns to mention it at all. But free speech? Judge Napolitano’s analysis on Bill O’Reilly was so wrong on constitutional law. There is no such thing as “hate speech” as unprotected speech under the First Amendment. There are “fighting words” (which the ad is not) and there is incitement speech, which the ad is not, as a legal and factual matter. 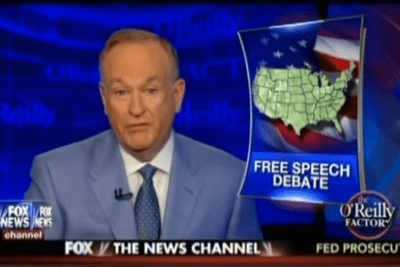 If Bill O’Reilly wants to debate the law, we’re more than ready. 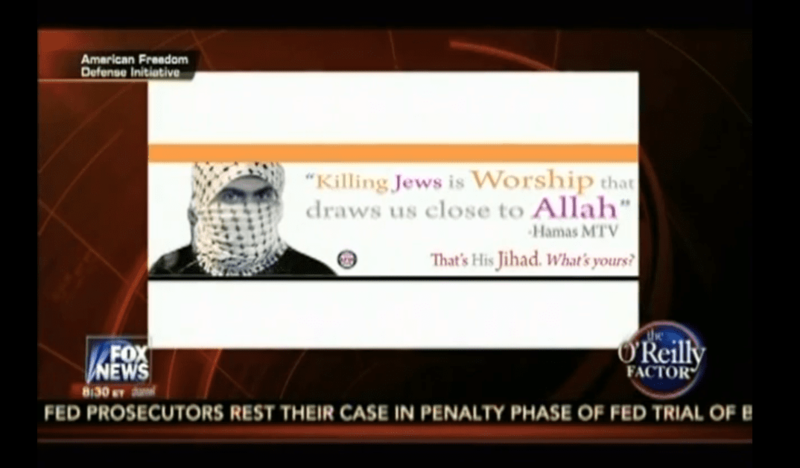 Bill O‘Reilly said that our ad could provoke some devout Muslim (not the term he used) or incite violence. Judge Napolitano agreed that it could, and if that were to occur, then our free speech ads could be stopped. Wrong. That is the classic case of the heckler’s veto. The statement by Judge Napolitano is dangerous. O‘Reilly said that the message might be lost in the ad’s headline, which is “provocative in the extreme.” Jihad, Mr. Reilly, is “provocative in the extreme” — not exposing it. I disagree. It is easy peasy. The federal judge was very clear on it. He added that if people are provoked to engage in “immediate violence” by the signs, then the court is going to have to readdress this case. Napolitano stated that the sign standing alone does not meet the hate speech standard under the law. In reality, there is no such standard. There are three possible exceptions to protected First Amendment speech: incitement, fighting words, and true threat. The legal standard says that the MTA has the right to prevent speech, that is, it can practice prior restraint of speech, on the basis that there is a reasonable foreseeability of imminent violence or lawlessness. For that standard not to be unconstitutional, it can only be applied in cases falling into those three categories. A true threat requires, under First Amendment jurisprudence, that one be directing the threat toward a specific individual about a specific crime: “I’m going to kill you.” Our ad does not constitute fighting words; in Jablonski, the Court makes clear that the words have to be spoken in a volatile face-to-face situation — such as the use of the N word in a confrontation. This ad controversy is symbolic of the world’s denial about islam. Kill, kill, kill, Islam never changes. Yet, amazingly, Pamela’s ads have become more shocking than the crimes they expose, more controversial than the crimes themselves! Clearly the world is cowering to Islam. Our leaders are shooting Pamela the messenger, because it’s far easier than confronting an islamic bully. But like the little choo choo that could, freedom and human rights has found a home on the side of a bus. So unpretentious they ride, so pedestrian a place, yet so glorious in purpose. Pam ‘s ads are so dignified in truth, so well-meaning in message, that even on the side of a muddy, smelly bus they can’t help but be magnificent.